The front page of the pro-government Star daily on Thursday bore a headline that targeted jailed Die Welt reporter Deniz Yücel saying he is not a journalist; but he is a hit-man of outlawed Kurdistan Workers’ Party (PKK). The headline on Star’s front page said “Gazeteci değil, PKK tetikçisi” which means “not a journalist, a PKK hit-man” in Turkish. According to Star, Yücel reports in Die Welt, from June 1, 2016 to Feb. 28, 2017, were examined by Turkey’s Directorate General of Press and Information (BYEGM) and some of them deemed as propagating the views of the the outlawed PKK. Printing a photo from Yücel’s interview with one of PKK’s heads, Cemil Bıyık, on its front page, Star also claimed Yücel purposefully used words, such as despot, oppressive, against women, leader that oppresses the opposition, in order to insult Turkish government leaders. Julian Röpcke, a political editor for German daily Bild. 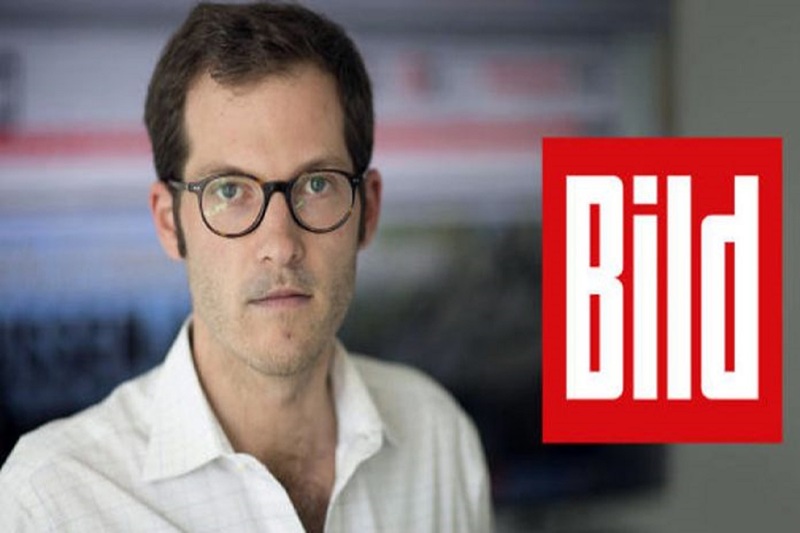 Meanwhile, Julian Röpcke, a political editor for German daily Bild, tweeted on Thursday that he turned down an interview request by Turkey’s state-run TRT because he believes that the TV station “shares responsibility” for imprisonment of hundreds of journalists across Turkey. “I received an interview request from Turkish state-owned @trtworld to discuss #Syria and #YPG issues. Here is my answer: As you know, Turkey has imprisoned hundreds of journalists due to alleged “pro-terrorist” views including my colleague Deniz Yücel, who is employed by the same company as I am. 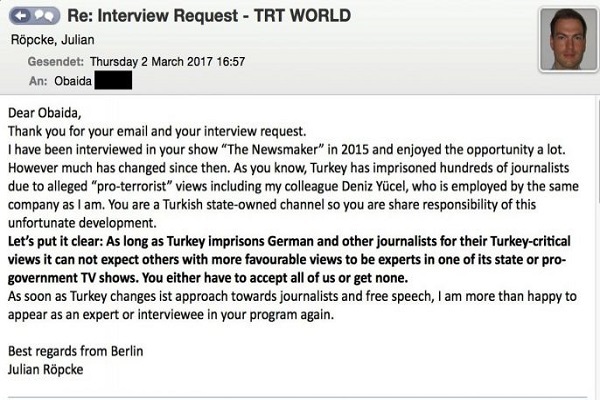 You are a Turkish-state channel, so you share responsibility of this unfortunate development,” Röpcke said in his response to TRT’s request. Access to the Bild’s website has recently been blocked by the Turkish government in Turkey. The decision came after Bild released reports severely criticizing the recent arrest of Deniz Yücel, a reporter for German daily Die Welt. “Let’s put it clear; As long as Turkey imprisons German and other journalists for their Turkey-critical views, it cannot expect others with more favorable views to be experts in one of its state or pro-government TV shows. You either accept all of us, or get none. As soon as Turkey changes its approach towards journalists and free speech, I am more than happy to appear as an expert in your program again,” Röpcke added. Following nation wide protests in Germany against Yücel’s arrest in Turkey, referendum campaign events by Turkish Justice Minister Bekir Bozdağ and Economy Minister Nihat Zeybekçi in German town of Gaggenau and Cologne were canceled by local authorities which caused tension between the two countries. Both countries summoned ambassadors in Ankara and Berlin on Thursday.